With the explosion of Social Media in the last couple of years, lead by Facebook‘s and Twitter‘s success, I’ve been hearing a lot of commotion from two opposing camps. On the one hand are people who don’t use social media. They are, by far, the majority (as Facebook has “only” 350 million users, and Twitter is still much-much smaller than that), but they are a quiet majority. The other, louder camp relies heavily on social media to pump a message of self importance. Most people writing in the blogosphere are early adopters, and as such tend to be ahead of the curve in adopting social media as well. There is no surprise, then, that the Internet is full of people calling anyone shunning from Facebook a Luddite. I’ve been spending more time in Social Media lately. There’s a lot going on in there. Many funny YouTube videos. Links to new and exciting gadgets. Reviews of various books . Pictures of kittens. What I found out is that when there is so much information, I have no time to engage in real conversation with real people. I comment on status messages, interacting with bits of information, not with people. It’s like a Turing test gone wrong, where I’m trying to separate human statuses from machine generated statuses. One thing I can do is ask for help. A few weeks ago I needed an old computer, so I asked if anyone I’m connected to is going to throw away his or hers. Within a couple of weeks I’ve got me a brand-new old-but-respectable working computer. People ask for opinions about products. They ask for help finding a specific song. Social media is a great tool to dip into the knowledge of the many and find stuff where Google is completely broken. This is useful, but it is not a replacement for the intimate connection you can only have with your best friends. This is you, using a service, to find information, interacting with information, and talking to the machine. If the Matrix ever existed, it would not have used people as a power source. It would have been an aggregate of human knowledge and computation. An intelligent being so complex, we couldn’t even comprehend its existence – the same way neurons in our brain don’t contemplate about our feeling of self. Communication is easier today, more than ever. This means couples keep in touch during the day. Children and parents know better what the other is doing. Close friends can stay closer. With the mobile phone, instant messaging, emails, Facebook and Twitter, I find it much easier to keep in touch with a select few. The advance of technology allows these few to be as far away from me physically as possible, it makes no differences. But they are select, and they are few. At the end of the day, social media has not changed much in how we chose our friends. It only changed how we spend our time with them. Compared with those watching less than two hours of TV, people who sat in front of the box for more than four hours a day were 80% more likely to die for reasons linked to heart and artery disease. So, if you are a heavy user of social media, please, use it on the go from a mobile device. Don’t sit in front of the computer for the entire day. Whenever you meet someone who is more accomplished than you, there is a moment of fear. At the job interview, the interviewer is more experienced than you are. At the test, the professor asking you questions has forgotten more than you ever knew. At the business meeting, the businessman across the table has a budget of millions. You fear you are not qualified for the job. You fear you are not smart enough. You fear you have no leverage. You fear because you are looking to improve yourself, and you constantly try to chew a bit more than you can bite. You’ve prepared for this test. You have a good product. You’ve done what you can. Your life is changing right now, and your body wants to run away? This is too important to turn back. Remember that if you don’t try, you have already failed. So, what is there to be afraid of? There’s nothing to lose, and only everything to gain. Look for the moment, though. If there isn’t any, you are not trying hard enough. Unless you live under a rock, you have heard that there were massive DDOS attacks that affected Twitter, Facebook and a few other sites. The sites affected had varying degrees of success in staying functional, but Twitter seemed to be the hardest hit. Given that Twitter was having issues for most of the day, many people migrated to other services like FriendFeed. However, FriendFeed is not an alternative microblogging platform, it is a completely different type of site. So, what can we do if Twitter goes down? If Twitter goes down, the blogosphere reacts as if the world is ending. It may be a bit much, but Twitter has become a mainstream application. When it goes down, a lot of people know about it. Can we avoid downtime? Probably not, but there are ways to work around this problem. First, Twitter could itself become distributed. Similar to software like email, why not have several Twitter installs around the world that all talk to each other? Here’s the thing: Once you have a winner in social-networks such as Facebook, or in real-time web such as Twitter, it changes the economy in those markets. The network effects of these products makes them extremely hard to defeat. Today, instead of fighting with Facebook and creating a competing social-network, it makes much more sense to compete within the Facebook economy (this is the angle that Zynga and iLike are playing). Facebook and Twitter, mainly because of their APIs, are becoming economies, and there’s no backup system in place. If Twitter decides to shut down third party clients, so only official Twitter client with official Twitter ads are used, they’ll can do it. Users have no-where to go. The internet technology stack is built on openness and sharing. Packet routing is a basic pay-it-forward mechanism where each server does its best effort. Firefox and other open-source projects got a huge boost through the shared efforts of many, and they are creating much needed competition to some evil monopolies. Currently, the leading social companies are (quickly!) becoming monopolies. Wave is coming with its own set of open protocols. If you want to create a Wave provider that competes with Google, you can. That’s good because (repeat with me): Where there’s competition, the consumers win. Email is a protocol. If I don’t like my email service provider, I can switch. It’s a hassle, but not impossible. Technology allows for competition. Competition drives the market. We win. When Gmail announced they are giving 1GB of storage and a new interface, suddenly everybody was innovating their email clients. Instant messaging is a service. When instant messaging just started, I was using ICQ. I hated ICQ, but I couldn’t move until my friends moved. I liked Messenger, but had to move when my friends started using Gtalk. I can’t chose. We need to build many Wave servers. We need competing Wave providers. We need to hook Wave into the existing APIs of the social-media services. We need to allow consumers to move from the monolithic services to the distributed technologies, without losing their connections. Once we are on the Wave, no one will be able to keep us away from our real-time web and from our friends. You can’t Fail Whale email, you can only Fail an email provider. 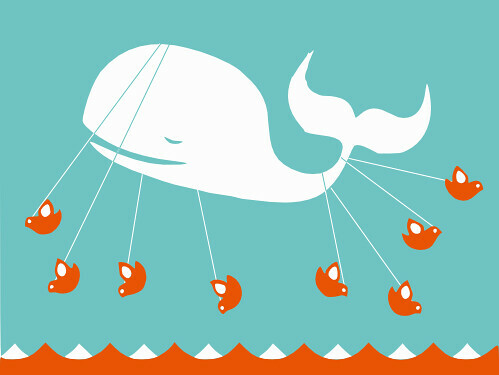 By moving from services to protocols, we can turn the Fail Whale into a Prevail Whale. Seth Godin has written a book titled “All Marketers Are Liars“, meaning all marketers are storytellers. They do not tell the whole truth and nothing but. It isn’t their job. The job of a good marketer is to sell you a story that you can relate to. A story that will create a brand, a movement, a want. The marketer wants you to remember the product when you are looking for a solution to a problem, and wants to assure you you’ve made the right choice when you are having second thoughts about money spent. The marketer’s job is to create perceived value, that is greater that the worth of the manufacturing. Think of Zappos – Zappos created immense value to their customers through exceptional customer service. Zappos isn’t about the shoes. It is about happiness. Think of McDonald’s – the king of fast food is not about the quality hamburgers. It is about very accessible burgers. Just look at how hard the marketers are working to change the perception of the company to understand how powerful your company’s image is. Now think of the generic DVD player you bought from an unknown Chinese provider. Why did you buy it? Because it is cheaper, and you couldn’t find anything remarkable in any of the other products. Quality of picture is the same, they all display Divx movies, they all have a USB plug, they all break after six months. So you bought the cheapest one. Without perceived value, you can only fight for price and the race to the bottom will kill a business. This week on TED, Rory Sutherland explained the job of a marketer with grace and a lot of humor. Also, he tells an unbelievable story of the branding of a morning cereals. A square turned into a diamond, becomes much tastier! In Israel there are four Internet Service Providers, which are basically the same. They give the same crappy service, the same bandwidth offerings, and the same prices more or less. It’s hard to tell exactly, because your price depends quite a bit on how much you are willing to haggle with the sales person. Yesterday I got the monthly bill from my ISP, and on the back of the envelope there was a poll result about who is the the most valuable (i.e. cheapest) ISP. In order to get an answer, they called many households and asked them who they percieve as the most valuable. No facts were harmed doing the creation of this poll. And a shame it is, since this particular question (who is cheapest) is really easy to answer. The worst thing you can do is have your customers catch you, as you try to pull one out of a hat. If you are tainted as a liar, nothing you say will change that for a very long time.